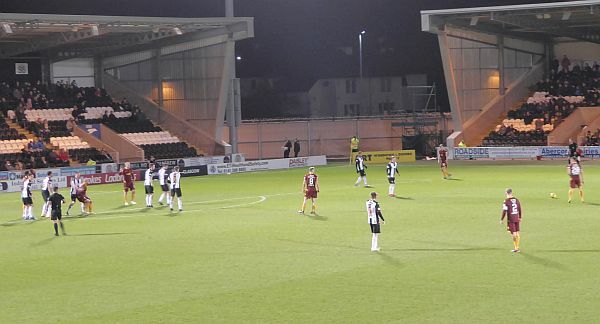 Motherwell scrambled to a fifth consecutive league win with a 2-1 over St Mirren in Paisley. Fine goals from Jake Hastie and Allan Campbell got us over the line and we move up the table to seventh place. After an excellent start and an exceptional goal we lost our way and St Mirren fought back to level the game. Elliot Frear was the catalyst in the second half and he set up Allan Campbell for the winning goal. As expected Stephen Robinson put his trust in the eleven that had delivered the recent run of wins. Gboly Ariyibi got proceedings underway and immediately Liam Grimshaw showed our intent with a forty yard dash down the right wing. We did not have to wait long before Jake Hastie lit up the Pasley sky with a screamer into the roof of the net from around 20 yards. David Turnbull was at the centre of the move that developed from our own half. The midfielder directed play and supplied Hastie on the right wing. Our boy cut inside and unleashed a spectacular hit that had Hladky flapping as the ball crashed into the net. Saints replied with a substitution before they had a couple of simple chances. First, Dreyer broke though the centre of our box but Mark Gillespie managed to get a touch to deflect the shot wide. Moments later the substitute blasted over the bar with the goal at his mercy. We made little in the rest of the half. Gone was our earlier flow and control instead there was a half hour of scrappy play and our hosts no doubt felt a little miffed that they went for the half-time talk a goal behind. Hastie earned the first cheer from the travelling support in the second period. He left his marker for dead with a tasty feint and charged to the dead ball line. His well weighted chip was inches short of the rising Ariyibi. A three against two break should have produced our second but a goal line clearance muted our hope as Main failed to convert Hastie’s cross. Carl McHugh and Elliot Frear came on for Gorrin and Ariyibi. Frear soon presented Main with a couple of chances – a shot across goal just wide then a side footed placement that the ‘keeper did will to deflect. The home side got the equaliser with twenty minutes remaining. A corner on our left was headed beyond Gillespie. Few could deny that they had earned it. But equality lasted only four minutes before Frear conjured up another fine sprint on the left. The winger placed a pinpoint cross for Allan Campbell to head home. Ross McCormack was given the last ten minutes to make an impact as Hastie was given a rousing cheer. News from elsewhere brought the happy news that we are now seventh in the table and just four points off the top six. Happy days.